Do you remember the first day of school? The butterflies in your stomach, the carefully selected clothes, the smell of pencil shavings, the new friends, and the new possibilities? At Albuquerque Collegiate this past August, it was all-hands-on-deck as founder and leader Jade Rivera’s dedicated team welcomed their founding classes of kindergarteners and first graders to the school for the first time. Students began the day as one school community for a calm, organized breakfast. In her morning greeting, founder and leader Jade Rivera taught and modeled strong scholarly habits such as college-bound hands, college-bound voices, full sentences, and tracking the speaker. Students gathered their belongings and transitioned to class for read-aloud and literacy stations until lunch. That night would be the first night for homework – and everyone was on board to show what they knew. Every day at Albuquerque Collegiate is a step on the path to college. This July, Allegiant Preparatory Academy opened its doors for the first time, welcoming students from Indianapolis’s east side. The early start gave founder and leader Rick Anderson and his team time to prepare extensively for their founding students. 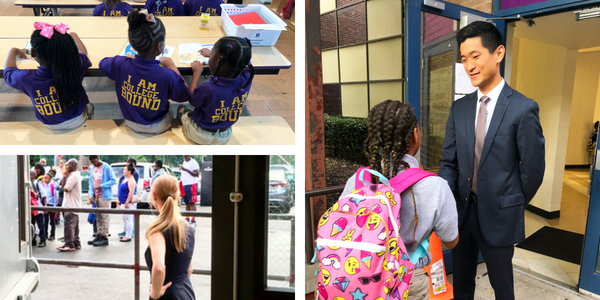 The first day began with firm handshakes and eye contact as students were greeted by Rick, followed by the founding team teaching the kindergarten and first grade students the procedures and rules that will help them have a successful school year. Aurum Preparatory Academy’s first day almost didn’t happen, but thanks to a huge turnout by parents at a final meeting, the county board handed down its approval. The school is living and breathing for the students of Oakland and their teachers, led with integrity and grit by founder and leader David Hardin. On day one, the founding team greeted their sixth graders with high expectations, tackling procedures while embodying the school’s GOLD values of growth, optimism and courage, designing, leadership, and learning. 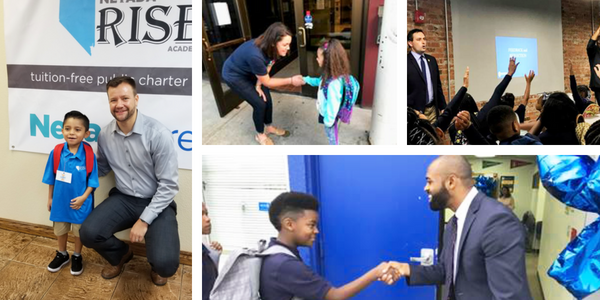 Clockwise from left: Nevada Rise Academy founder Justin Brecht and a student, Persistence Preparatory’s Joelle Formato gives a firm handshake, Buffalo Collegiate’s Brian Pawloski leads a session, Aurum Preparatory Academy’s David Hardin greets a student. The founding team of Believe Memphis Academy worked hard all summer long in anticipation of opening this past August. When the school opened its doors to their founding fourth and fifth graders, the building was clean and ready, decked out in school colors and the school mascot, a feisty badger. Teachers brought enthusiasm and vigor to morning processes and students responded in kind, ready to learn and showing it with straight backs and college-bound hands. The long-time dream of founder and leader Brian Pawloski, Buffalo Collegiate‘s first day kicked off at 7:00 am sharp, with middle school students greeted by staff and welcomed into a building decorated with powerful signage that speaks to the school’s values. Teachers sweated the details, from the work completed over breakfast to the tough and honest feedback delivered to parents at the end of the day. The first BES school in Clarksdale, Mississippi, Clarksdale Collegiate opened its doors this past July with 150 kindergarten, first, and second graders decked out in purple polos with the school’s logo embroidered on the front and the determined declaration “I AM COLLEGE BOUND” emblazoned on the back. Students jumped into work, with reading starting over breakfast in the cafeteria decorated with gold and purple signage reading “Class of 2029,” “Class of 2030,” and “Class of 2031,” the years of their future college graduations. 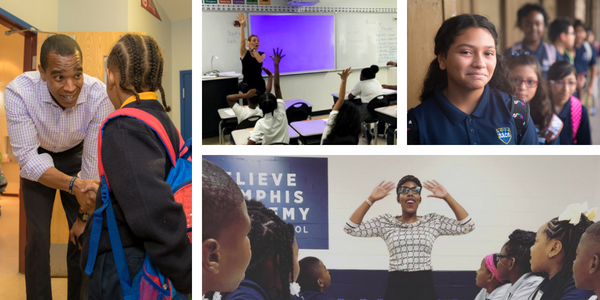 Clockwise from left: Allegiant Preparatory’s Rick Anderson says hello, Key Collegiate’s Katie Mazer shows off a college-ready hand, Étoile Academy’s students are ready for the day, a Believe Memphis teacher brings the enthusiasm. This August, Emblaze Academy founder and leader Kristen Shroff saw vision become reality for the families of the Bronx, New York. Following several half days for student orientation, the school welcomed its founding fifth grade class for their first full day on August 27. Professionalism matters at Emblaze Academy, with Kristen sweating every tucked-in shirt and every professional shoe as she greeted her new students at the door. She sweat the details inside too, holding students up to a high bar and rewarding those who met it with enthusiastic high-fives. Étoile Academy opened doors for the students and families in the Gulfton and Sharpstown areas of Houston. School founder and leader Kayleigh Colombero had designed and prepared lessons to teach students their REACH values of Respect, Excellence, Ambition, Community, and Hard Work with smiles and joy. Though some of the fifth graders had arrived that morning understandably nervous for their first day of middle school, students boarded the buses ready to tell parents about day one, eager for the next day. 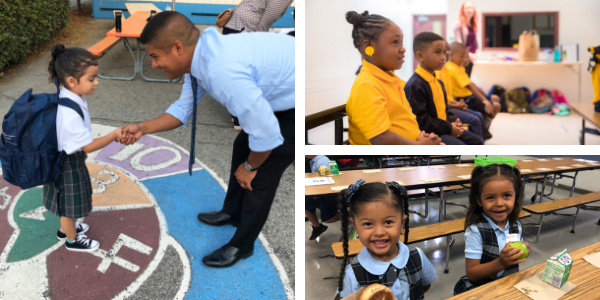 The transitional kindergarten, kindergarten, and first grade students of Excelencia Academy were greeted on their first day of school by an excited, prepared founding team led by school leader Ruben Alonzo. Students immediately got down to work, learning about the importance of a strong, professional handshake at the morning greeting. From there they learned about school processes, giving speakers their full attention and tracking with their eyes, and the motivational college cheers that will open every school day. For the students of Excelencia, college starts here. Clockwise from left: Excelencia Academy’s Ruben Alonzo greets with a smile, students in perfect STAR at Allegiant Preparatory Academy, all smiles at Soleil Academy. On day one, Key Collegiate founder and leader Katie Mazer showed her students what a proud college hand looks like, as students got down to the work of assessing their reading goals for the year. Calm music welcomed students into the lunch room, and energetic high-fives commended a job well done at the end of the day. 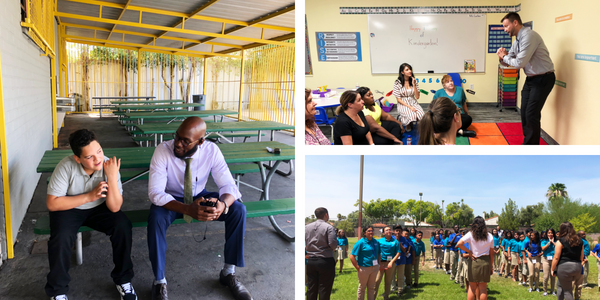 The teams behind Nevada Rise Academy, an elementary school, and Nevada Preparatory, a middle school, have been working hard to open in Las Vegas, with the mission to create a rigorous, results-focused student pipeline from elementary to middle school. Located in the same building, the schools opened together, successfully mastering efficient arrival and dismissal processes with a combined car line for over 250 students. Founders David Blodgett (Nevada Preparatory) and Justin Brecht (Nevada Rise Academy) greeted their students with enthusiasm and focus. The schools started strong, with clear processes and practiced lessons bolstered by values and systems. Clockwise from left: Vox Collegiate’s TyAnthony Davis connects with a student, Nevada RISE’s Justin Brecht shows off star for his team, students are lined up and ready to go at Nevada Preparatory. Students at Persistence Preparatory Academy practiced strong eye contact and professional handshakes as they were greeted by founder and leader Joelle Formato, before enjoying a tone-setting breakfast with calm music and focused minds. Joelle set a high bar for her students and her staff, teaching students how to wait in line for the bathroom appropriately and live coaching teachers with specially-made signs. At Persistence Preparatory Academy, teachers expect student to Do It Again until all everyone meets the high expectations set for them. At Soleil Academy, founder and leader Beatriz Gutierrez’s strength of vision and her teachers’ commitment to growth was palpable from day one, from the moment they first greeted students by the school gate on that bright, sunny day to the orderly dismissal. Every moment of the first day was meticulously practiced and managed, with teachers responding to real-time feedback with urgency and purpose. The school grounds had been carefully prepared in support of students, right down to the brightly-colored tape laid down to guide the young founding students through their first school day. As the Soleil staff says: be a ball and roll with it! The first day for Vox Collegiate of Los Angeles dawned bright and early, a running theme for the California schools. Founder and leader TyAnthony Davis immediately set to work instilling the school’s values and beliefs regarding the power of communication into the founding community of sixth and seventh graders. Working with all of the students, he led a group session on the importance of students using their voices in school, and the school’s use of speech and debate to support students in developing the ability to express and advocate for themselves.